"What I learned from yoga is that it's not about the form and posture. It's how you engage in the posture. "When you engage in the posture rather than trying to create a form, you are free to be where you are." YOGA & MOVEMENT FOR LIFE. Focus on the Modern Yogi, Mama, and multidimensional human being. Yoga mama, run commuter, self care advocate, explorer & educator of movement , meditation, & magic. I earned my Bachelor of Science degree in Kinesiology (the study of Human Movement) 1999 & Education with a minor in Psychology in 2000. Teaching fitness movement classes since 1995, and a former white water rafting guide, I tried yoga as a dare after my ski conditioning class in 2000. Since then , yoga has been a paddle in the ebb and flow of life. In 2005, I completed my first 200 hr Teacher Training certification at CorePower Yoga in Vinyasa style, where I taught all levels of CorePower, Yoga Sculpt, and Vinyasa Styles. Also, I was certified in Budokon (yoga & martial arts) , YogaEd (yoga for children) & completed 300 hr Anusara Yoga teacher training. In my continuous learning, I have training and experience in Hot Yoga, Prenatal Yoga, Yin, Yoga Sculpt, Restorative and Therapeutics. Life led me to hike, practice and teach yoga with various teachers , 6 months amongst the colorful chaos of Northern India and Nepal. In 2015, I completed 300hr Yoga Therapeutics with Rachel Krentzman ( RPT, E-RYT of Embody Physical Therapy & Yoga) (2015) , Thai Massage Flow with Erin Kammerer (2016), and Mat Pilates Certification (September 2017). I learn with Livia Cohen-Shapiro on How to Create a Psychologically Sound Yoga Classroom and completed TRE (Tension & Release Exercises) Module 1, and Anatomy Trains in Motion in Oct 2018. My most recent training was Yoga for PTSD/Trauma with Suzanne Manafort and Patty Townsend of Mindful Yoga Therapy In March 2019. 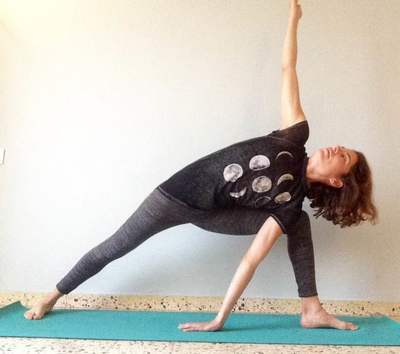 A former yoga teacher trainer for Kinneret Yoga Teacher Training, 3 years, I teach continuing education workshops and 200 hr Yoga Alliance Teacher Trainings- Upcoming training January 2019 in Jerusalem. When I'm not teaching, I'm an avid runner (placed 3rd Israeli women Jerusalem Marathon 2017 and ran my first Ultra - 50k in the hills of Jerusalem), explorer of the outdoors, a curious cook , and enjoying one of my greatest teachers of all ,my daughter, Anava.